Can anything beat the wonderful fall traditions of carving pumpkins for Halloween and baking homemade pumpkin pie for a fall dessert? Only the satisfaction of doing it all with homegrown pumpkins. Growing pumpkins and carving or baking is a great family project, particularly baking a pumpkin pie from scratch–if the rich pumpkin flavor doesn’t surpass any pie you ever tasted, your sense of accomplishment will. Summer is the best time to start growing pumpkin plants from pumpkin seeds. Check catalogs and seed packets for varieties recommended for pies. You can carve any pie-friendly variety for a jack-o-lantern, too. 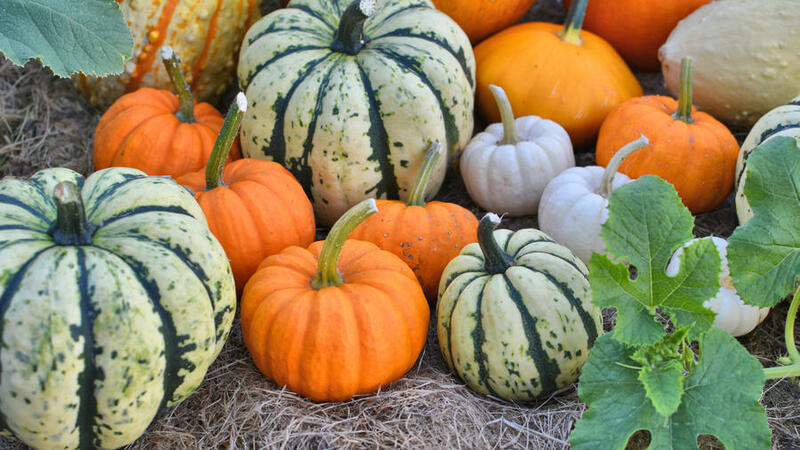 However, take note: If you’re interested in growing a white pumpkin or green pumpkin for fall decorating, you might not achieve the same kind of flavor from the flesh for pies. We have grown several kinds of pumpkins in our Test Garden, then sent the harvest to our Test Kitchen, where cooks used the pureed pumpkin flesh in scratch pies. In the tasting that followed, ‘Cinderella’ won top honors and ‘Small Sugar’ came in a close second. Both varieties have a rich, sweet pumpkin flavor and flesh that bakes well into a firm but creamy filling. Choose a site in full sun. After the danger of frost is past and the soil is warm, create mounds of soil about 6 inches high, 1 foot in diameter, and 6 to 8 feet apart (remember, one pumpkin vine can eventually occupy up to 500 square feet of space). Sow seeds 1 inch deep, planting five or six per hill. After the pumpkin seedlings sprout, thin to the two strongest seedlings. As they grow, steer new shoots in the direction you want them to crawl. When you water, try not to splash the leaves, since this encourages mildew. Feed plants regularly with a balanced granular fertilizer or liquid plant food. As the pumpkins mature, slip a sheet of plastic foam, a peice of plywood, or a shingle under each fruit. This will keep the pumpkin’s shell from touching the ground and developing rot. Pumpkins mature three to four months after planting. When the shell has hardened and has a strong, even yellow color, harvest is close. In cold areas, after the first frost kills the leaves, cut the fruit from the vine, leaving at least an inch of stem. Elsewhere, harvest after the leaves and vines turn brown and brittle. Store pumpkins in a cool, dry place until you are ready to prepare them for pie.